To make ordering as simple as possible the system only asks you to enter the exact width and height of your picture or part picture during the order process if any tolerances are required the system will apply them automatically. 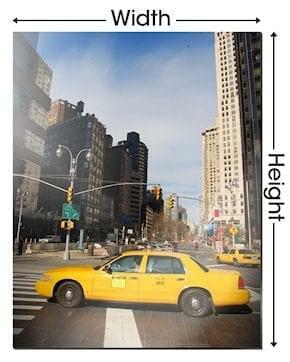 If your picture is printed on paper and you wish to frame the whole picture, measure the exact width and height of the picture. This will be the size to enter as your picture / image size. If you only require a picture frame and no mount we will manufacture and send you a frame to fit this size. If you require a mount, this size will be reduced by -4mm all around and the opening in the mount will be cut this exact size. This is done to ensure the opening in the mount sits just over your picture and the picture cannot fall through the opening. The mount will then go all around ( be added to ) this opening, exact opening + Border left-right-top-bottom. 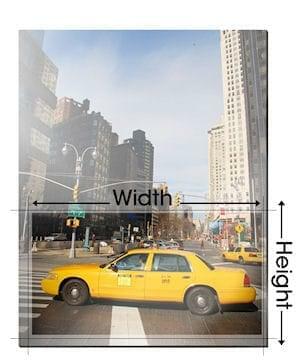 If your picture is printed on paper and you wish to frame only a part of the picture, measure the exact width and height of the part of the picture you wish to frame. This will be the size to enter as your picture / image size. 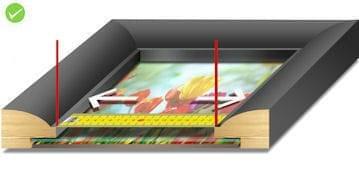 As a picture frame has a rebate, when the picture is fitted inside the frame the total viewing area at the front of the frame will be approximately 10mm smaller than the picture size. The edges of the picture inside the frame will be covered by approximately 5mm all around the item, top-bottom-left and right.